Those snowy pictures from way back in March seem like such a distant memory as I sit here in the heat of the summer, and that afghan I was working on then looks as much like a torture device as the rack right about now! Amazing how one's perspective changes with the seasons! It's about two months past the end of my second semester in nursing school and a lot has happened since taking that last final exam and giving my brain a rest. We took a family road trip to Disney World, my brother and his family came to visit, our children finished their 4th and 6th grade years of school, and just this week I have finally been able to spend some quality time in my sewing room again. So far, this summer has been just what the doctor ordered! 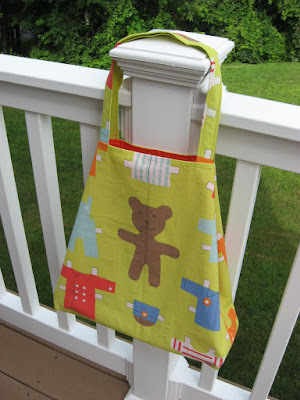 Keep on reading to see the darling teddy bear paperdoll tote bags I made yesterday. 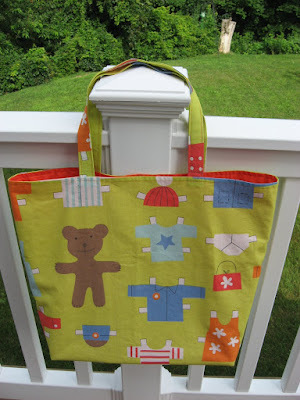 There are two of them exactly the same, and these would be so perfect for anyone of any age to use as a library bag, a project bag, an overnight-at-Grandma's bag, a travel bag, a beach bag, or for any other purpose. 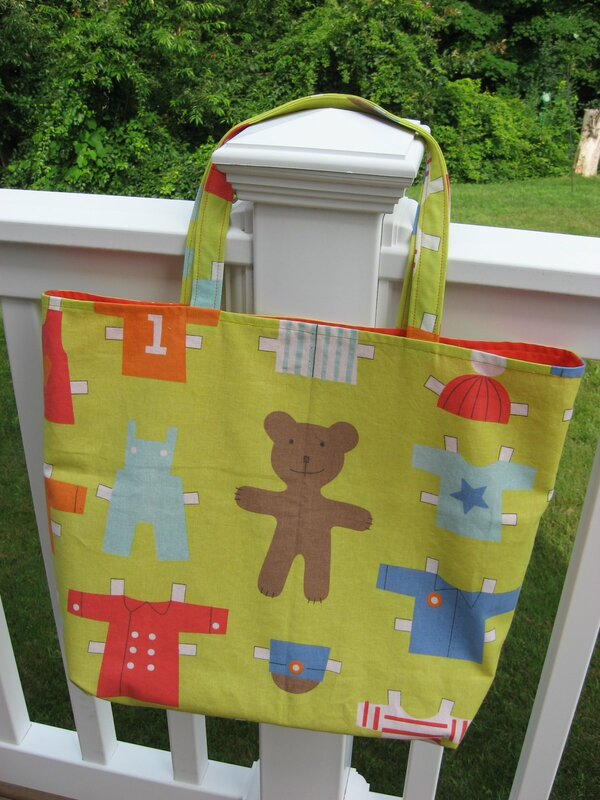 Isn't this fabric just the cutest? The entire outsides of the bags, plus the handles, are made using this darling teddy bear paperdoll fabric. 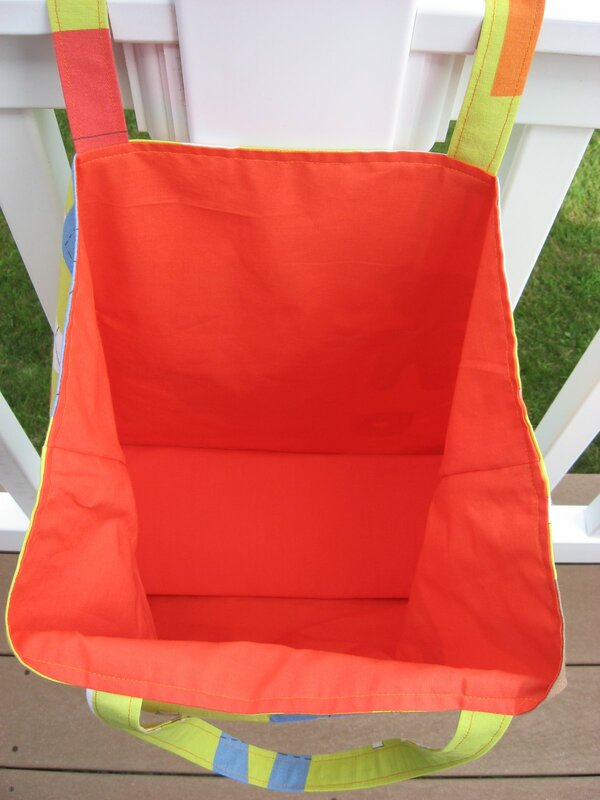 The insides of both bags are lined with top quality 100% cotton quilting fabric in a bright and happy orange. There is also a removable stiff bottom in each bag to keep the bag bottoms flat. 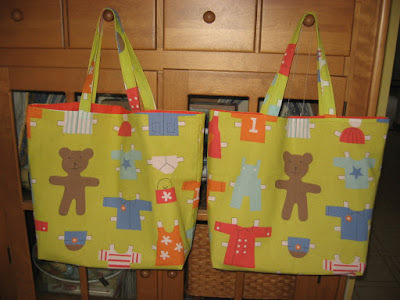 The sides of these bags are floppy, making them lightweight and perfect for carrying a little or a lot. Can't you picture a pair of twins heading off to Grandma's house with their matching teddy bear totes? Too cute! These bags each measure 5 by 14 inches at the boxed base, 19 inches across the top from side seam to side seam, and 14 inches tall. You can check them out over in my Etsy shop if you're interested in purchasing one or both. 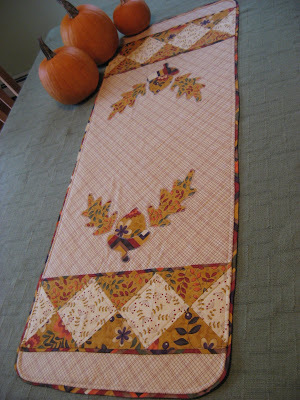 In a few days, I'll also be showing an afghan that I have completed and a woven fabric basket in gorgeous fall colors. It feels so nice to have my creative juices flowing once again, and I'm trying to make the most of the time I have before semester 3 begins in September! Are you being creative this summer too? I'd love to know! I think about you so often, Mary Grace! I hope you are having a restful summer break. 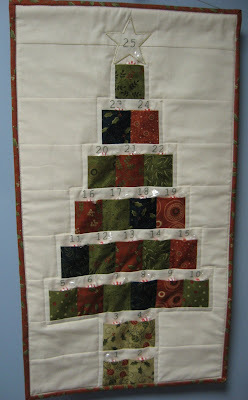 I am so glad you are getting to spend a little time in the sewing room!! The tote bags are great and the fabric is adorable! 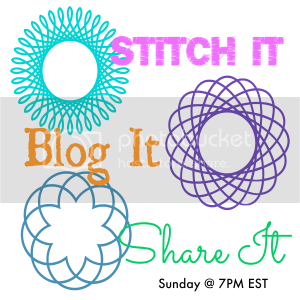 I would love for you to link up to the Stitch It, Blog It, Share It Link Party Sunday nights at 7pm at BehindtheSeamsSewing.com. 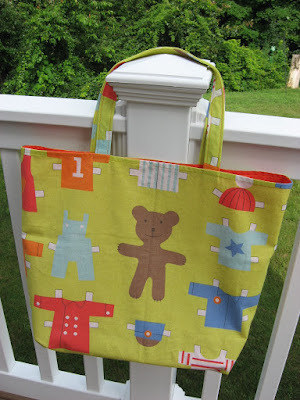 Cute tote but I am still at your first paragraph...nursing school....good for you!!! Gotta have a brain rest....I admire you!! !